We are widely known firm engaged in exporting and supplying of Swiss Cottage Tent for High Wind Area. 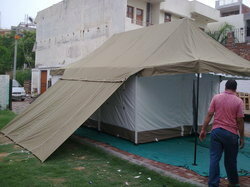 These tents are made from best quality cotton canvas, which make them durable for high winds. Our offered products are well reckoned in the market for their attractive designs and cotton sheeting under lining. Made of durable frame structure, we offer these products in various sizes as per clients' requirements. Looking for Cottage Tent ?